Clearly the best dog in the world, the Boerboel is certainly one of the most powerful you’re likely to meet, but quite charming with it. Bred to tackle lions, he is certainly capable of looking after you and your family and will do so willingly, generally staying close to you whenever he can. A bloomin’ good walk every day is required, as is plenty of mental stimulation. 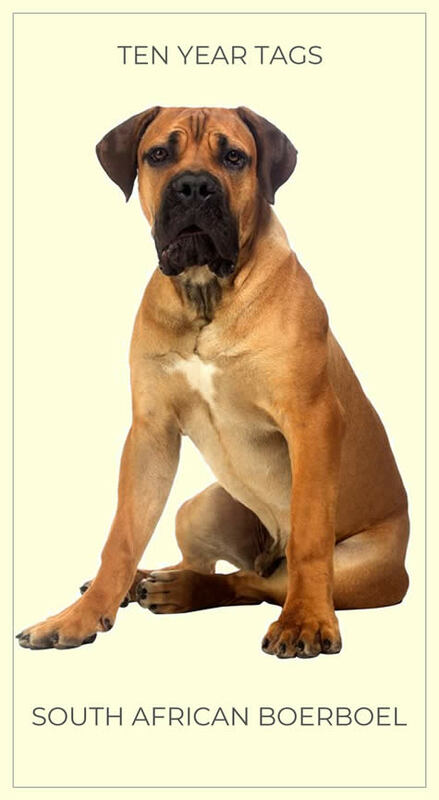 The Boerboel is also extraordinarily handsome. We GUARANTEE to replace your tag for 10 years if your Boerboel is being bullied by another dog and has to hand it over (unlikely) or it’s just lost. T&C apply. See website for details. Buy Your Boerboel a Hand Made Solid Brass Dog ID Tag Today!